American standard doesn't exist anymore, it's now called American Pro. Probably the same set-up as per the Epiphone Les Paul that is made in China, under licence. You only notice a difference in sound if you have the two next to each other. For a relative newbie like me, it’s hard to justify the extra £1k for the American Gibson! Having said that, it is only the price of a mobile phone so what the hell! MN means Maple neck. This is a real fender strat but it's made in Mexico. Nothing wrong with it at all but you can buy American ones on the used market for this kind of money. :) I thought so it normally says American Standard on the expensive ones. 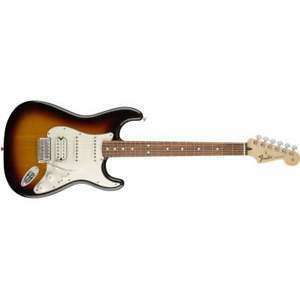 I have a Meixan Strat love it! Clearly a successful post then as following you submitting it, they've sold out. There was low stock availability when I ordered a few hours ago. EKO NXT series acoustic guitars are great for the money. I bought one as my regular daily practice guitar so that I won't cry if I knock it about too much. My main acoustic is a Faith Venus acoustic. I'm left handed and to be fair whenever I see a nice guitar I usually buy it so er I'm not sure how many guitars I actually have, I should probably count them as two of them are worth a lot and I should insure them, so yeah I'll er go do that then. ED: I just checked and I have the EKO NXT 018 CW. Which is about £159 or so, so yes unfortunately twice the price of this guitar. A cracking guitar for the price. Yes. In the same way that Lewis Hamilton drives a Mercedes. I had a Mexican Tele for years, and the build quality was superb! Just a beautiful guitar and amazing sound. Eventually gave it up because it was quite heavy and gigging day after day for hours on end became a ball-ache! True but to be fair (and in my opinion) there is a lesser chance to get a rubbish MIA one than MIM. MIM were really good in the 90s though so it's always worth to check the aftermarket! I never actually ordered one, silly me. This or Guitar Hero Live? Deffo mate, don't know how loads of artists over the past few decades have been able to play these hideous CBS Strats! It's not like some of em don't have the money! Last good strats were made around 1965 before Leo Fender sold the business to CBS. After that they just lived off their name. Never miss a 'Fender Guitar' deal again! Went and picked it up this afternoon. Lovely. Not a mark on it, no smudges, no finger marks from handling, looks brand new. Smells brand new - you know that urethane(? )&amp;glue smell? The tremolo has never been fitted (they asked me if I wanted it on, I said not now) and they put a new set of strings on, replacing the 9's with 10's, and their luthier gave it a full tune up, which is why I came back to pick it up today rather than take it home yesterday. Deal? I reckon it was. And, thank you for making me think again and look around.. I would never have found it had you not said what you did. Kudos. Nice. You got a good deal there. The only thing I don't like imho about this strat is the humbucker at the bridge. Even with coil tap you can never get that unique out of phase sound between the bridge and middle pickup as you do with a single coil at bridge. I've tried over the years with Seymour Duncan e.c.t but have gone back to stock Fender single coils. The Texas specials are good for a thicker sound though, shame not put at bridge as well then that would be good strat. Still voted hot as seems a good orice if made in USA. Heat cos it's a nice instrument for the money. Looking at the high end Mexican on for myself at the moment. Thank you. Give me somewhere to start. Includes gig bag, strings, tuner, picks and an instruction book. Free delivery. RRP listed as "£195.00", do whatever with that information as you please. Price is now £188. Seems it was a very hot deal after all. Clearly they aren't Cowboys. You shouldn't slate a company for no reason. People work hard to build reputations up. I had a positive experience when dealing with them. Better get a banjo then. If I was after a starter guitar, I'd definitely get this. Hi, My husband wants to learn how to play an electric guitar and as his birthday is approaching thought i would but him one.....i know nothing about them so i hope you guys can advise what is a good starter? Still have an old Squier Fender, a good... 15 years old now and still not a great deal wrong with it. This is a VERY good starter kit for the money (especially if it's not the Chinese built one). I'd raise the bridge, file down the nut and take the buzz out of the low E.
Likewise - played a strat and HATED it. Definitely a marmite guitar. But a good price so hot from me. +1 for the yamaha F310, it's a better guitar for less money, the samick greg bennet guitars are good beginner's instruments as well. I've owned a few fenders, acoustic and electric and although some were good guitars they were all over priced, the big name builders have become lazy in recent years and with the advent of CNC machining even cheap guitars are very accurately built. That said this is a better price than I've seen for this model so have some heat. Ideal for a beginner who isn't sure if they'll keep up playing or they'll give up, but if someone is looking for a gift for someone who already plays, they should spend a bit more for something which at least has a solid top. Fantastic deal. It's a decent amp. HOT. Don't need another amp. Don't need another amp. Looks like GAK.co.uk have pricematched it too. Possibly end of line discontinued stock?